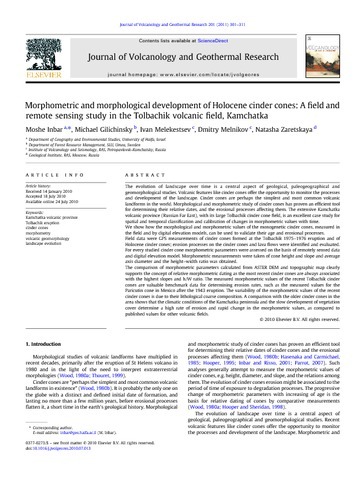 Inbar Moshe, Gilichinsky Michael, Melekestsev Ivan, Melnikov Dmitry, Zaretskaya Natasha Morphometric and morphological development of Holocene cinder cones: A field and remote sensing study in the Tolbachik volcanic field, Kamchatka // Journal of Volcanology and Geothermal Research. 2011. V. 201. P. 301-310. 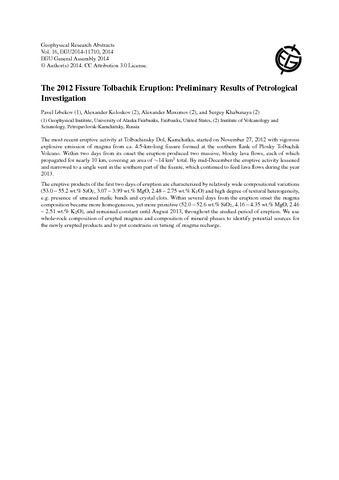 Abstract We provide results of a detailed study of the first peridotite xenoliths of proven mantle origin reported from Bezymyanny volcano in the Klyuchevskoy Group, northern Kamchatka arc. The xenoliths are coarse spinel harzburgites made up mainly of Mg-rich olivine as well as subhedral orthopyroxene (opx) and Cr-rich spinel, and also contain fine-grained interstitial pyroxenes, amphibole and feldspar. The samples are unique in preserving the evidence for both initial arc mantle substrate produced by high-degree melt extraction and subsequent enrichment events. We show that the textures, modal and major oxide compositions of the Bezymyanny xenoliths are generally similar to those of spinel harzburgite xenoliths from Avacha volcano in southern Kamchatka. However, coarse opx from the Bezymyanny harzburgites has higher abundances of light and medium rare earth elements and other highly incompatible elements than coarse opx from the Avacha harzburgites. We infer that (1) the sub-arc lithospheric mantle beneath both Avacha and Bezymyanny (and possibly between these volcanoes) consists predominantly of harzburgitic melting residues, which experienced metasomatism by slab-related fluids or low-fraction, fluid-rich melts and (2) the degrees of metasomatism are higher beneath Bezymyanny. By contrast, xenolith suites from Shiveluch and Kharchinsky volcanoes 50–100 km north of the Klyuchevskoy Group include abundant cumulates and products of reaction of mantle rocks with silicate melts at high melt/rock ratios. The high melt flux through the lithospheric mantle beneath Shiveluch and Kharchinsky may be related to the asthenospheric flow around the northern edge of the sinking Pacific plate; lateral propagation of fluids in the mantle wedge south of the plate edge may contribute to metasomatism in the mantle lithosphere beneath the Klyuchevskoy Group volcanoes. Silicate glasses in peridotite xenoliths from Avacha volcano have high SiO2 (up to 72 wt.) and highly SiO2-oversaturated characteristics; normative quartz content is up to 50 wt.. The glasses represent secondary melts solidified after interaction with mantle peridotite, i.e. crystallization of secondary orthopyroxene at the expense of olivine. We identified two kinds of silicate glasses in Avacha peridotites; one is higher in K2O and enriched in Rb, Ba, U, and Pb than the other. The glasses show basically similar chemical characteristics to the host basaltic andesite to andesite of the Avacha volcano. These chemical characteristics are inherited from slab-derived fluids/melts, which metasomatize the mantle wedge and induce partial melting. The differences of chemical features among the Avacha glasses are attributed to chemical difference of the slab-derived fluids/melts, possibly due to the difference of sediments/basalt ratio of the relevant slab. The low-degree partial melt of peridotite assisted by these fluids/melts, is primarily SiO2-oversaturated, and can conduct silicate metasomatism, evolving through interaction with surrounding mantle peridotite, i.e. formation of orthopyroxene at the expense of olivine. Highly silicic glasses, also reported from peridotite xenoliths from oceanic hotspots and continental rift zones, mostly result from assimilation of orthopyroxene by SiO2-undersaturated melts, which crystallize clinopyroxene and olivine. The glasses also show similar trace-element patterns to their host alkali basaltic magmas, as in the case of arc glasses/calc-alkali magmas. If the glasses in peridotite xenoliths are of silicate metasomatism origin, they are similar in chemistry to host magmas. Reaction between carbonatite melts and peridotites shows the same petrographical feature as that of SiO2-undersaturated silicate melts with peridotites. The glasses originated from carbonatite metasomatism, however, exhibit clearly different trace-element patterns from their host alkali basaltic magmas. Lithospheric mantle is inferred to be more oxidized than the asthenosphere, and mantle-wedge peridotites are characterized by high oxidation state relative to abyssal and continental peridotites due to addition of slab-derived fluids or melts. We found metals (native Ni, Fe silicides, native Fe and possible native Ti) from otherwise oxidized sub-arc mantle peridotite xenoliths from Avacha volcano, Kamchatka. This is contrary to the consensus and experimental results that the metals are stable only in deeper parts of the mantle (> 250 km). The metals from Avacha are different in chemistry and petrography from those in serpentinized peridotites. The Avacha metals are characteristically out of chemical equilibrium between individual grains as well as with surrounding peridotite minerals. This indicates their independent formation from different fluids. Some of the Avacha metals form inclusion trails with fluids and pyroxenes, leading to the inference that very local metal saturation resulted from rapid supply (‘flashing’) of reducing fluids from deeper levels. The fluids, possibly rich in H2, are formed by serpentinization at the cold base of the mantle wedge just above the slab, and they reduce overlying peridotites. We propose a metal-saturated peridotite layer, underlying the main oxidized portion, within the mantle wedge beneath the volcanic front to fore-arc region. 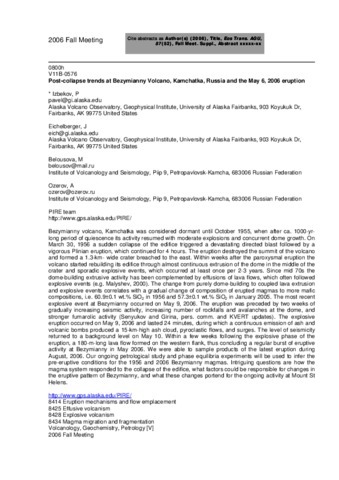 A new Klyuchevskoy volcano eruptive cycle encompasses terminal (March 30, 1972 to August 23, 1974) and lateral (August 23, 1974 to December, 1974) eruption stages. The terminal eruption stage resulted in lava flows and parasitic cones that formed on the south-western flank of the volcano. Eruption products are moderately alkalic high-alumina olivine-bearing andesite-basalts. The terminal eruption stage was accompanied by volcanic earthquakes and volcanic tremor. The lateral eruption was accompanied by explosive earthquakes. 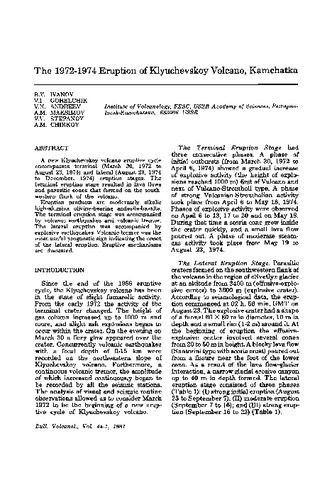 Volcanic tremor was the most useful prognostic sign indicating the onset of the lateral eruption. Eruptive mechanisms are discussed. 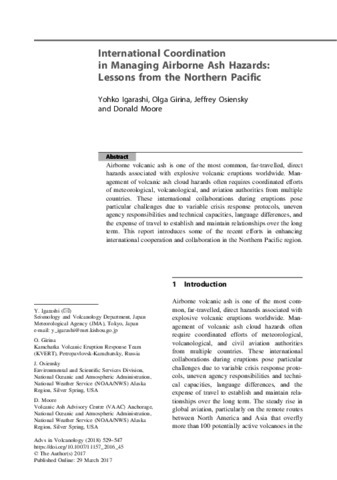 Izbekov P., Eichelberger J., Belousova M., Ozerov A. Post-collapse trends at Bezymianny Volcano, Kamchatka, Russia and the May 6, 2006 eruption // AGU Fall Meeting 2006. Eos Trans. AGU, 87(52), Fall Meet. Suppl., Abstracts. 2006. P. V11B-0576. Calcic cores in plagioclase of Karymsky andesite of the 1996–2000 eruptive cycle texturally and compositionally (both trace and major elements) mimic the plagioclase phenocrysts of basalt erupted 6 km away at the onset of the cycle. 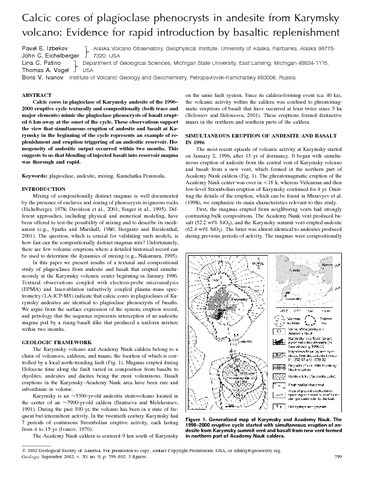 These observations support the view that simultaneous eruption of andesite and basalt at Karymsky in the beginning of the cycle represents an example of replenishment and eruption triggering of an andesitic reservoir. Homogeneity of andesitic output occurred within two months. This suggests to us that blending of injected basalt into reservoir magma was thorough and rapid.